Stormandstars.net: Sweet Baby By Donna - Round 2! 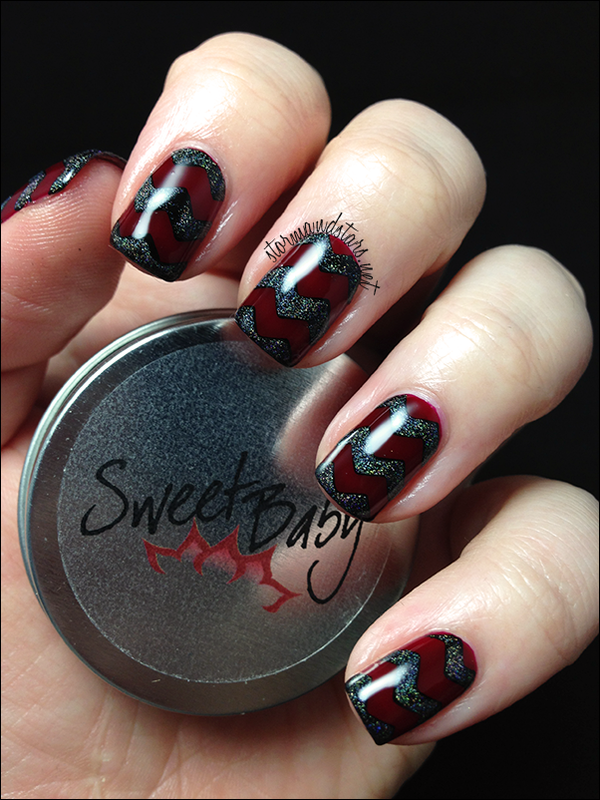 Sweet Baby By Donna - Round 2! I'm back today with a review of some of my all time favorite products. This review is not a nail polish review, but a review of some hand and skin care products that I can't live without. 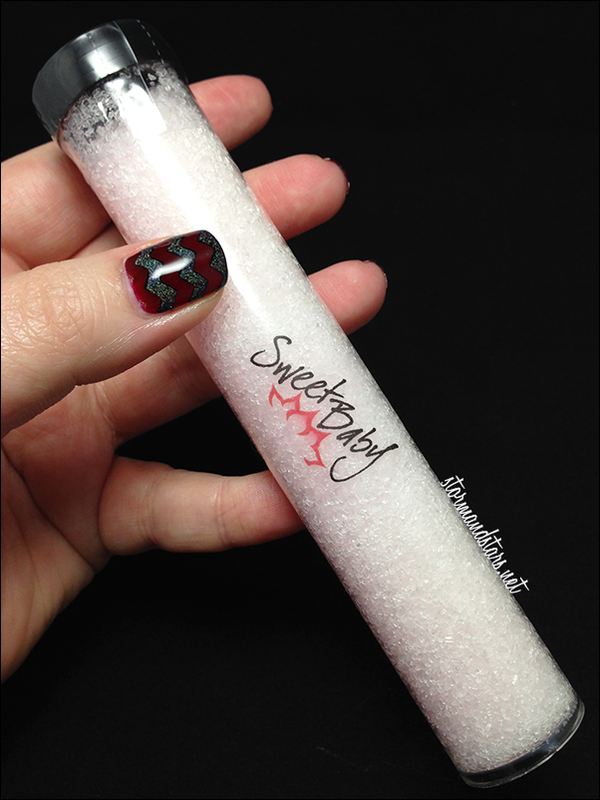 As you may remember, Donna from Sweet Baby By Donna sent me some cuticle oil and balm to review a while back and I absolutely loved the unscented oil. Recently she added my favorite scent, Pink Sugar, to her line and sent me some new products with that scent to review for her. I can't tell you how excited I was to get some more stuff from her! Included in the package were a cuticle oil, a cuticle balm (with her new formula from the one I received formerly) and a tube of bath salts. Donna's packaging is simple and beautiful and all black and red which I absolutely love. 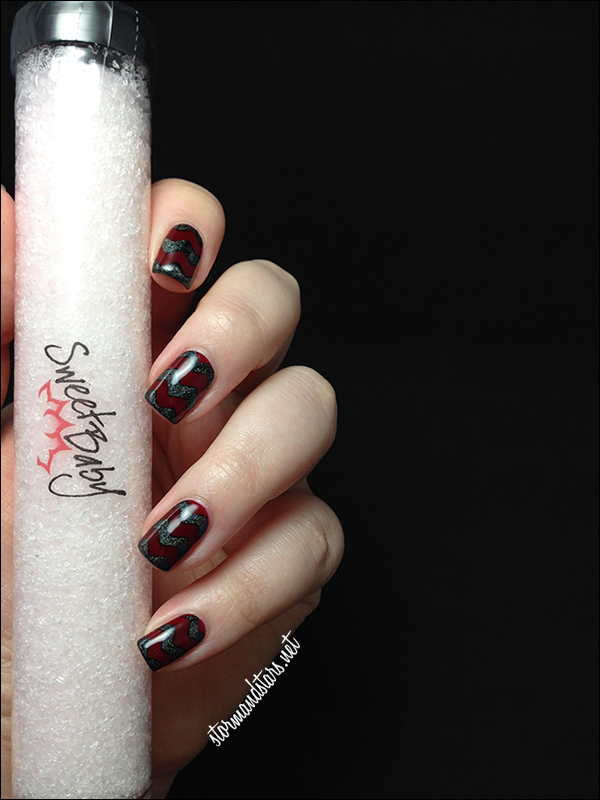 I decided to show off these products with a little nail art in her signature colors. Lets start with the reformulated balm. When Donna first sent me her balm it was the middle of summer and she wasn't selling it yet due to the high temps, so I didn't want to review it yet. I am so glad I waited! This new balm is so creamy and smooth and everything I could possibly want in a cuticle balm. I hate when balms make my hands greasy or oily and this soaks in so quickly that I never run into that problem. I love the Pink Sugar scent, but Donna also has other amazing scents like Tip Of Tranquility and for people who are sensitive to scents she has Namaste, an unscented balm with an earthy smell that just comes from the natural ingredients. I've been told that there are also some new scents coming soon for the winter months, so keep your eyes out for those! Donna also sent me a new bottle of her roll on cuticle oil, which is perfect for after painting your nails or between swatching, because it soaks in almost immediately and won't leave that oily look in your photos. I love that this oil comes in a roller ball bottle, it makes application easy and quick. I keep one bottle on my desk at work and two more at home for easy moisturizing all the time. The third product Donna sent me is her newer bath salts. I love that I have matching scents of all these haha! I was hoping to be able to use this product sooner, but unfortunately, a bath with a broken foot is out of the question, though I am thinking about soaking just my feet in it. I did, however, find a volunteer in my girlfriend. She has been complaining about her hands being cracked and dry lately so I suggested we soak them in the salts to restore some of the nutrients. We used about a quarter of the tube in a big bowl of warm water and she soaked her hands until the water was cool. Afterwards, her hands were super soft and a lot of the damage was looking better. She said they felt much much better! We coated her entire hands in the cuticle balm after and we're hoping to repeat the process a few more times to get max results. 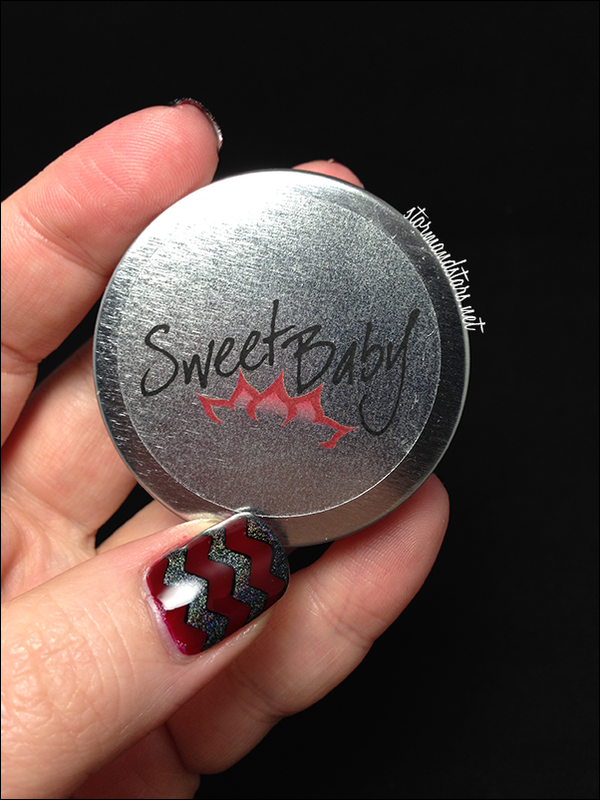 Overall I am more than happy with my Sweet Baby By Donna products. I use my balm and oil every day and the salts may become a permanent part of my regimen. Donna has also recently added a lotion and some lip balm to her shop which I haven't tried yet, but if her other products are any indication I am sure they are fantastic! You can purchase Sweet Baby products in Donna's shop HERE. Don't forget to also follow her on Instagram for news on shop updates and restocks as well as some fantastic nail art! I'm really curious about trying a cuticle oil that isn't oily... it almost seems too good to be true! Thanks for the review!